On to step 5 of giving feedback to your manager: Identifying the feedback and doing the final preparation for the feedback! If you want to give feedback to a manager, you have to make sure you have engaged in step 1 (prepare and start a log) , step 2 (give positive feedback on the behaviors you do like), step 3 (set up a contract for when the manager wants feedback) and step 4 (talk to HR). If not, you are taking some risks that your feedback may backfire. That is, your manager could be resistant to the feedback, not trust your feedback, could directly or indirectly engage in recrimination over time. Yes, giving feedback to your manager is a risk, and no, it’s not fair that managers could engage in some bad behaviors solely on you trying to give them feedback! 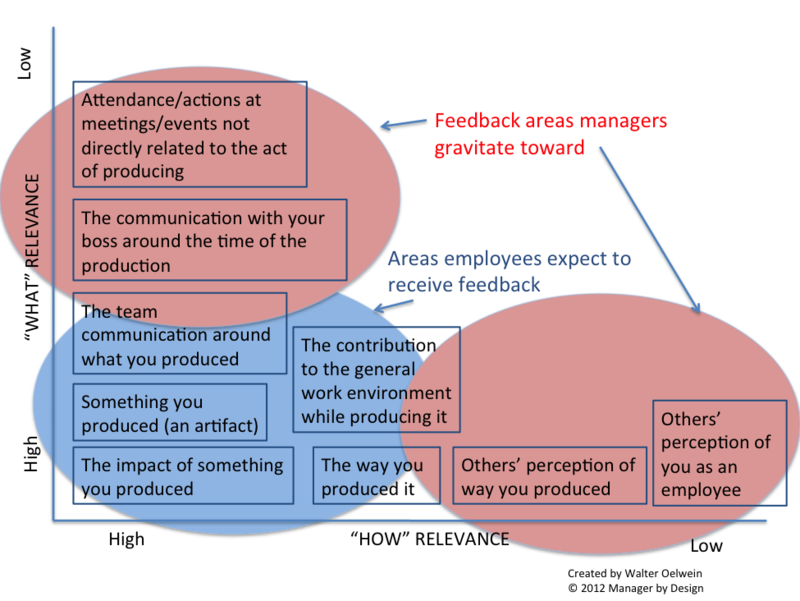 The emerging field of Management Design needs to address this design flaw of Managers engaging in immature and recriminating behaviors based on an employee trying to help the manager improve, but until then, here’s an approach to take to get that much needed feedback to your manager. 1. Analyze your log to make sure that you know which feedback you’d like to prioritize. This is the latest in a series of posts to help employees give corrective feedback to their manager. If done well, the manager improves at being a manager, the team works better together, and there is less cost of poor quality management. If done poorly, the manager can recriminate on the employees trying to give feedback, making a bad situation worse. This is the latest in a series of articles designed to help employees give managers feedback about the manager’s behaviors as managers. In previous articles, I describe how keeping a log on what the manager does helps you identify strategies for changing your own behavior, and when to give systematic, positive reinforcement. The key to both of these is that you identify the specific behaviors that you’ve observed, rather than summarize the general behaviors, and this creates the ability to provide feedback that works at actually helping you manage your boss’s behavior. In today’s article, I’ll provide some tips for how to approach a manager whose behavior you’d like to change for the better. This is a more risky than providing positive feedback or changing your own behaviors (as discussed in previous articles), but sometimes it is necessary, because a manager who is doing things wrong can have a huge negative impact on the team, and typically only the employees are close enough to the situation to be able to correct it. But how? This article is the latest in a series of articles identifying the step for how employees can better provide feedback to managers. In the previous article, I describe the first step for providing feedback to your manager is to create a log on your manager’s behavior and the impact of the behavior. This way you can identify patterns and even simply change your own behavior and strategies that change the dynamic without having to go into giving feedback. It’s a start. Now, on to providing feedback, and that’s step two: Reinforce the positive behaviors that you want to see repeated. Giving feedback to a manager is a lot easier if you focus on the behaviors that you like and want to see more of from your boss. But it isn’t a matter of just saying, “Good job” to your boss. You have to be more systematic and specific than that. The idea is that you want to provide reinforcement of the specific things that your boss did, with the aim that you are training your boss to continue to do the things you like. Setting up the process of positive reinforcement is designed to re-focus the boss’s efforts to the things that work for you and your team. The things that don’t work do not get reinforced, so boss does these things less over time. Instead, your boss is likely to increase the reinforced behaviors to continue to get the positive reinforcement. The Manager by Designsm blog advocates for a new field, “Management Design,” which systemically attempts to create great managers by design rather than by accident. I have recently run a series of articles examining a flaw in the current management design: Managers don’t receive specific and immediate feedback on how they are doing with people management. The series concluded the best candidates for providing feedback are the manager’s employees themselves. However, this has its risks, since the less artful the feedback the more dangerous the situation for the employee. It is perhaps best if the manager ask for feedback from their employees, and this blog provides tips for how to do this. However, whether or not feedback is requested, employees must be careful in how they provide feedback to their managers. In the coming articles I’ll walk you through the steps to give feedback to your manager.